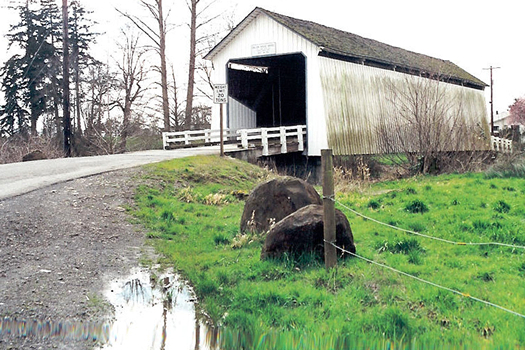 The Gallon House Bridge, the last of Marion County's original covered bridges, is located over Abiqua Creek a little more than a mile northwest of Silverton. The name Gallon House was due to the bridge's use as a "pigeon drop" for liquor at the north entrance. Operators at a liquor dispensary nearby sold "white lightening" whiskey by the gallon to Silverton residents. At the time, Silverton was "dry," not allowing liquor to be sold in town, while Mt. Angel was "wet." The Gallon House along Abiqua Creek was in Mt. Angel territory. During the Christmas Flood of 1964, the bridge suffered considerable damage. The County Board of Commissioners, however, decided the bridge should be repaired and maintained as an historical landmark, as it was the only covered bridge in the county at the time. In 1985, the old wooden structure was closed to all traffic when a damaged chord rendered it useless. County road crews repaired the bridge to accept traffic up to a 10-ton limit by reinforcing a lower chord, as well as making repairs to the beams and flooring. Also included in the renovation was a change in the size and shape of the portals. The revamped portals were hinged to allow them to be opened for taller loads when necessary. In 1990, because of poor structural condition, the bridge was rehabilitated to mint condition and the hinged portals were removed. Since its construction in 1916, the bridge has been repaired numerous times. Historian Ben Maxwell describes a prior bridge repair in 1960: "Marion County recently reconstructed the old Gallon House bridge near Mt. Angel just for the sake of preserving a landmark. It still looks like an overgrown doghouse - at least they could have painted it red for the sake of conformity." HOW TO GET THERE: From Salem travel north on Highway 213 (Silverton Road NE) about 14 miles to Silverton. At Silverton travel north on Highway 214 to Hobart Road. Turn west on Hobart to Gallon House Road (0.5 mi.). Turn north on Gallon House Road.